By Kaylin Bade. Pictured above is Barry Kormeier, New Haven. Union, Mo. - The final night of the Franklin County Fair ended with local tractor pullers competing for the top spot in their association. The Gateway Tractor Pullers put on a great show for the crowd. Results from the pull are as follows. Union, Mo.- The Franklin County Fair Queen was crowned seconds ago during opening night of the 2013 Franklin County Fair. Miss Andi Placht, New Haven, daughter of Bill and Barbara Placht was crowned 2013 Miss Franklin County. She is a ten-year active member of the New Haven 4-H Club and four-year member and current President of the Washington FFA Chapter. Union, Mo. - After receiving a report that Michael Zweifel, 51-years-old, grabbed his daughter by the hair and then held a handgun next to her throat, Franklin County deputies responded to the 3000 block of Sunset Lane where the incident had occurred. Late Saturday night at approximately 11:45 p.m. deputies responded to the area, located about four miles south of Union, Mo. According to Sheriff Gary Toelke after deputies arrived on the scene they determined that a male and female at the residence were watching the grandchildren of their daughter. It was alleged there was a party at the residence for another family member while the grandchildren were there. Union, MO - Crowning of the 2013 4-H King and Queen was the highlight of the annual Franklin County 4-H St. Pats Coronation held in Union. Lauren Hoerstkamp, New Haven 4-H Club was crowned 4-H Queen, and Cole Rucker, Rockford Rebels 4-H Club was chosen as 4-H King. 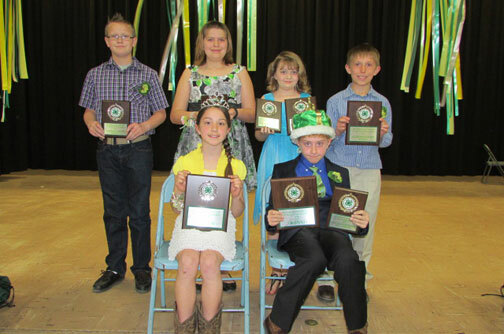 The 4-H King and Queen are chosen based on the amount of funds raised to support Franklin County 4-H Council events and activities. The funds are raised by 4-H clubs and the candidates. Union, Mo. 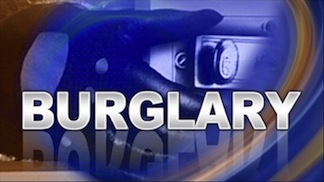 – On Tuesday Franklin County deputies investigated a burglary that had occurred in the 2600 block of Highway AH, approximately eight miles south of Union, Mo. Sheriff Gary Toelke said deputies discovered that copper wire, copper tubing, and electrical cords had been stolen from the residence. 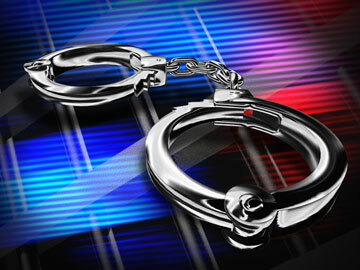 They also found a key piece of evidence, resulting in the arrest of a husband and wife duo. FRANKLIN COUNTY, Mo. - The Second Blessings Food Pantry in Union, Mo is currently holding their 8th Annual Community Coat Drive until Oct. 25th. Winter outerwear items such as gently used and new coats, scarves, gloves, boots, etc. or being collected. Items will then be distributed on Oct. 25th from the Union Moose Lodge from 9 a.m. to 1 p.m. Anyone needing winter clothing is welcome and there are no obligations. 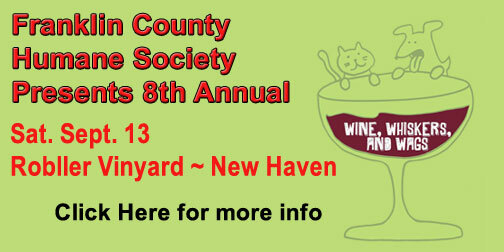 --The Franklin County Humane Society will be holding their 8th Annual Wine, Whiskers, and Wags on September 13, 2014. In memory of Judy Sharpe, one of the founders of WWW, we will be returning to Robller Winery and Vineyard in New Haven, where the first Wine, Whiskers and Wags was held. Registration will begin at 4:30pm, where guests are invited to immediately start checking out and bidding on items of the silent auction. The live auction will begin at 7pm.